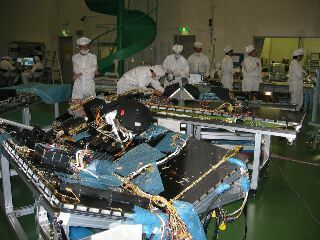 The flight components onboard Astro-E2 scheduled for launch in early 2005 have been fabricated, and the first integration and test (I&T) with them was started on July 1st, 2003. Now we are checking electronic signals and commands if they work as they are designed. Since a spacecraft is a huge complicated system with a great number of parts, there are always mistakes in spite of enormous efforts to avoid making them on the way of designing or creating subsystems. Those problems have to be found in the early phase, and to be fixed immediately. One of the purposes of the first I&T is to find any such mistakes through a great number of mechanical and performance tests which assume various situations which may lead to error. The dewer of XRS (X-Ray Spectrometer) and the optical bench of the X-ray telescopes are on the spacecraft baseplate, the outline of the spacecraft is constructed (Photo 1). The side panels are fanned out on tables, and equipped with basic meters. The electric tests and cable checks are carried out (Photo 2). The spacecraft and side panels are in a clean room, and the data and commands are sent and received over computers in a checkout room next to the clean room. 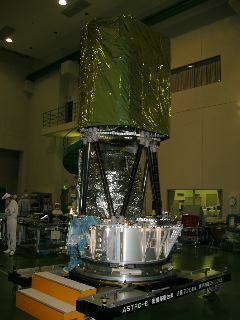 Photo 1: Present spacecraft status. The dewar and the extensible optical bench of the X-ray telescopes were assembled on the spacecraft baseplate. Photo 2: The side panels are fanned out on tables, and electral tests are performed. Lately, scientists and engineers from NASA/Goddard Space Flight Center and MIT have joined us. The 1st I&T is supposed to be finished at the end of November.